A Small Circle in Asia Contains More Than Half the World’s Population – But How many GI Scientists are from here? 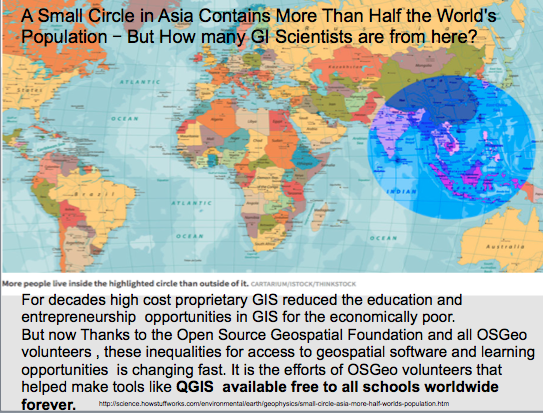 For decades high cost proprietary GIS reduced the education and entrepreneurship opportunities in GIS for the economically poor. But now Thanks to the Open Source Geospatial Foundation and all OSGeo and open education volunteers , these inequalities for access to geospatial software and learning opportunities is changing fast.It is the efforts of OSGeo volunteers that helped make tools like QGIS available free to all schools worldwide forever. Future is shaped by the decisions made by everyone everyday. 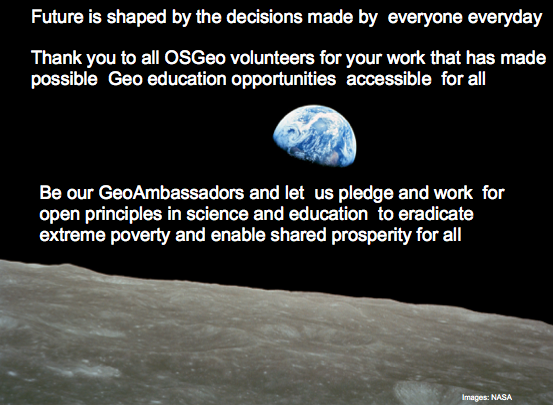 Thank you to all OSGeo volunteers for your work that has made possible Geo education opportunities accessible for all . Be our GeoAmbassadors and let us pledge and work for open principles in science and education to eradicate extreme poverty and enable shared prosperity for all.